Image courtesy of Pennant Hills Demons Media. St George Dragons vs. Pennant Hills Demons – Olds Park on Saturday, April 14, 2018. St George have been a fixture in the finals for several years in a row, but the Dragons are yet to open their account in 2018. After an opening round where they were well-beaten by East Coast, their first home game also promised to be a tough one, up against defending champions, Pennant Hills. It didn’t get any easier for the Dragons when they found themselves kicking into the wind in the first term. The Demons were also coming off an opening-round loss. But, helped by the wind, they wasted little time in asserting themselves into this contest. The Demons were looking good early, winning most of the contested possessions and not allowing the Dragons any opportunities to work their way into attack. Some inaccurate finishing would work against the Demons, but four unanswered goals opened their lead up to 28 points at quarter-time. St George had some work to do to get back into the contest, but the Dragons came out breathing fire and lifted their work rate around the ground. They weren’t the easiest of conditions, with the inconsistent wind picking up some kicks and blowing them over their targets, while other passes failed to reach their mark. 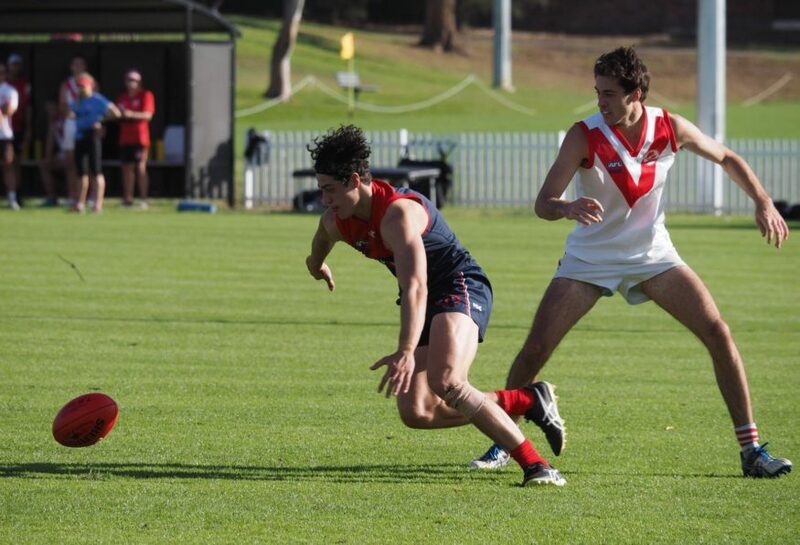 But with an increased resolve in the second term, the Dragons found opportunities opening up. With five goals to one for the quarter, Pennant Hills’ lead had been reduced to six points at the long break. The Demons were easily the better side during the premiership quarter, but some wasteful finishing would hold them back. A return of 3.8 for the quarter was a reflection of the weight of scoring chances they were building, but also a reflection of opportunities lost. Some of the shots were from tight angles or a long way out, and the conditions weren’t helpful, but there were some chances that had the Demons faithful shaking their heads in disbelief. But, despite the wayward finishing, the Demons held the Dragons to two goals and held a 20-point lead at the last change. In the last quarter, the Dragons were coming home to the scoring end, but they were unable to make anything of their attempted comeback in the last quarter. A team with plenty of young players still inexperienced at this level, the Dragons had been under the pump all day. The relentless Demon pressure and the stress of playing from behind all day took its toll. The Demons were in control, and the Dragons were unable to get enough of the ball to compete. It was all Pennant Hills in the final term, with six goals to two, turning the game into a comfortable 48-point win. With 34 scoring shots to 11 for the day, the margin could easily have been even more. But it was a comfortable return to the winners list for the defending champions and one that sends a message to the Sydney footy world that the Demons will again be genuine contenders in 2018. Alex Goodall was superb for the Demons, kicking four goals in a best-on-ground performance, while Tom Angel and Ranga Ediriwickrama were ball magnets all day. Tim Coenen, Dom Michalak and Ben Jones were tireless workers for the Dragons on a day when too many of their number were unable to make a significant impact on the game. The draw hasn’t been kind to the Dragons, having to play East Coast and Pennant Hills in the first two rounds, but the results so far have seen the Dragons come well short against quality opposition. PENNANT HILLS GOALS – A Goodall 4, J Boag 3, N Mace 2, N Hey 2, M Vidler, T Angel, S Wray. ST GEORGE GOALS – J Ellings 2,M Bridgland 2, A Markos, B Jones, K Anu, N Ryan, S Randell. PENNANT HILLS BEST – A Goodall, T Angel, R Ediriwickrama, D Dell’Aquila, J Adams, T Wales. ST GEORGE BEST – T Coenen, D Michalak, B Jones, J Pearson, M Bridgland, N Ryan.